We like Community Coffee. Some of their coffees we like more than others, but overall they seem like a good company. It seems like they have an offering to satisfy every coffee drinker. As we continue to search for good tasting decafs this Café Special would soon be brewed. It is described as offering a satisfying semi-sweet, full bodied flavor that is perfectly balanced and strikingly distinctive. It is a medium roast with mild acidity and a full body. There is a nice nutty aroma that greets you when you open the bag. This aroma is enhanced after the beans are ground. The aroma was not that strong as the coffee brewed in the auto-drip. It feels to me like a medium to light bodied coffee as you drink it. The acidity is very mild and the flavor spreads out over the tongue. Finally we used the Chemex coffee maker to brew this decaf. There is a slight semi-sweetness and a mild acidity. The aftertaste seems to hit the sides and front part of the tongue. The body felt light to medium here. This is an average decaf coffee. It is low cost and comes in whole beans which makes it inviting to try. It is o.k. 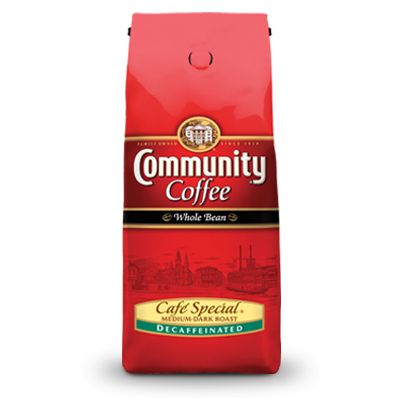 but Community Coffee has some other decafs we would like to try. We received this coffee for free and offer objective feedback. Until next time remember to stop and enjoy the coffee and conversation. I think I’ve tried just about every coffee from Community Coffee except the Decafs. We have tried a lot of their coffees too. We are looking forward to trying some other decafs. We really like their Evangeline Blend and French Quarter Fusion.